Jennifer Weaver’s new book, The ABC's of God's Character, ($11.99, paperback, 9781498447089; $5.99, e-book, 9781498447096) shows children the person of their God using artistic illustrations and appropriate scripture verses. Using the alphabet as a backbone, this will create an easy to learn list for your child to memorize and lean upon for knowledge and assurance. It’s a fun read for kids – a visual aid that will help young readers to know God as He is revealed in scripture. Jennifer Weaver is a wife and mother of three who lives in the Pacific Northwest. She was raised in the church and schooled in bible-based curriculum including the Cornerstone Curriculum, the Catechisms, and Church history. She loves to use the world around her to help her children learn about their Creator. Without watering down the truth or character of God, she attempts to use what has been given to us by God to make him understandable to children, wherever they are in life. She continues to attend a church that teaches solid, biblical doctrine and theology as well as lead bible studies. She also enjoys reading many books by theologians and well-known bible authors. Xulon Press, a division of Salem Media Group, is the world’s largest Christian self-publisher, with more than 15,000 titles published to date. 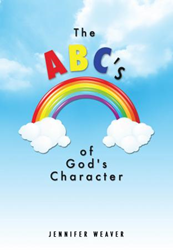 Retailers may order The ABC's of God's Character through Ingram Book Company and/or Spring Arbor Book Distributors. The book is available online through xulonpress.com/bookstore, amazon.com, and barnesandnoble.com.